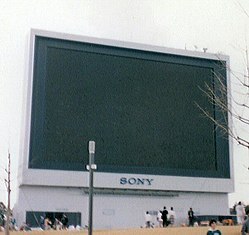 The Sony JumboTron made its debut at World's Fair 1985. 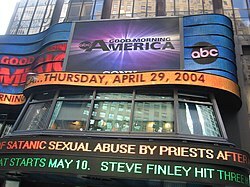 The "Super Sign" on ABC's Times Square Studios facility was a very large Sony JumboTron. This unit was later replaced with a Mitsubishi Electric LED display. The JumboTron was originally manufactured by Sony, and is recognized as one of the largest non-projection video displays ever manufactured. Sony creative director Yasuo Kuroki is credited with the development of the JumboTron. While the JumboTron and similar large-screen displays are physically large, they were often low in display resolution. The JumboTron at the now-demolished Tampa Stadium in Tampa, Florida, measured 30 ft (9 m) diagonally with a resolution of only 240×192 pixels, below VHS resolution. Screen size since then varies depending on the venue. The display introduced in 1985 was 40 meters wide by 25 meters tall. Newer, LED-based large screens have an order of magnitude greater than the early JumboTron resolution at a fraction of the cost. For example, the much publicized center-hung video board in the Dallas Cowboys' AT&T Stadium is 72 feet tall and 160 feet wide (22 m x 49 m), displaying HDTV at 1920 x 1080 resolution, 45 times more pixels. The largest JumboTron in use was located at SkyDome (now Rogers Centre) in Toronto, Ontario, and measured 10 m tall by 33.5 m wide (33 ft × 110 ft) at a cost of US$17 million. By comparison, a similar-sized LED system sold today would cost around $3 million. The Rogers Centre JumboTron was replaced in 2005 by a Daktronics ProStar as part of a stadium revitalization project. Originally, the JumboTron was not an LED (light-emitting diode) display since blue LEDs were unavailable at the time, and the only green LEDs available were of the traditional yellow-green variety, which were unsuitable for an RGB display. Each display consisted of multiple modules composed of 16 or more small flood-beam CRTs (cathode ray tubes), each of which included from 2 to 16 pixels composed of red, green, and blue phosphors. Sony displayed one of the earliest versions at the Expo '85 World's Fair in Tsukuba. Eventually, JumboTron systems adopted LED technology as blue and pure green LEDs were developed. LED-based systems have about ten times the lifespan of CRT-based systems, a key reason for the change. Although JumboTron is a registered trademark owned by the Sony Corporation, Sony stopped manufacturing the devices under that name in 2001 and the word jumbotron has since become a genericized trademark. ^ Popular Science. p. 10. ^ New York Magazine. p. 20. ^ Tailgate to Heaven: A British NFL Fan Tackles America - Adam Goldstein. p. 119. ^ a b ManVentions: From Cruise Control to Cordless Drills - Inventions Men Can't Live Without - Bobby Mercer p. 115-116. Meares, Harriet (1997). Precedents and Issues with Billboard Live's JumboTron: The First Electronic Board on West Hollywood's Sunset Strip. H. Meares.